In 1903 Robert Gray was one of Partick Thistle’s most important forwards. The Weekly Record interviewed him in March. The burgh of Kirkintilloch has produced few first class players of note. No one has had more experience than Robert Gray of Partick Thistle FC. Every club’s following has it’s particular favourite, and at Meadowside there is no more popular player than the scoring forward who adorns the inside left position. A representative of the Scottish Weekly Record sought out the Partick Thistle player the other day after he had quitted the daily toil at the foundry where he is employed as a moulder.Gray is one of the most reserved of fellows. He is not given to talking about himself or his play but after the Record man had drawn him out a bit he forgot his reserve and chatted freely about the international and kindred topics. “Well I thought some of our men were off their game. I think our players go in for too much dribbling. The English players were not so individual in their style. There was more man to man about their game, and they were a splendid combination, especially in the second half. Our team was picked on merit. There is no doubt about that, but they lost heart after losing that first goal. The first goal in a cup tie or big match like last Saturday’s means everything to a team. If you are on the side that loses the goal things somehow go wrong, and the other side plays with greater confidence and get into a better stride. “Either Doig or Rennie will do for goal. We will need at least one back from England, possibly two. In any case McCombie should be one of them. We cannot do better at half back than play Aitken (Newcastle), Raisbeck (Liverpool) and Robertson. Jacky was not seen at his best last Saturday. He had to run back very often to cover Sharp and then keep his forwards going. I fancy McLuckie (Aston Villa) as a better centre forward than any we have here. He is good at keeping his wings together, and is an excellent shot. Templeton and Walker should be the right wing, and I don’t think we could do better than Speedie and Alec Smith together, and if they play their game, the forward play should show a great improvement. “I don’t think there will be much difference in the English team at Sheffield. The defence could not be improved, and Bloomer and Bache will likely be the only change. It’s a toss up which team wins. I believe the first goal will decide the match. “If a man is pleased with his club, and things are going well, he never bothers his head much about the matter. But when cverything is going wrong he thinks it pretty hard that he cannot go where he chooses once he has fulfilled his contract. “We have nothing to grumble about at Partick. So long as a fellow does his best at Meadowside he gets every encouragement from the officials. I consider the current team at Partick the best team the Thistle have had since I came among them. Some Saturdays we have an off day like most teams; on others, again, the team really play a wonderful game. The Partick district is one of the most enthusiastic football centres in Scotland, and the gates this year are bigger than ever. The club is splendidly supported, and I believe the Thistle will do well in the League for a long time to come if the club continue to be as well managed as it is. 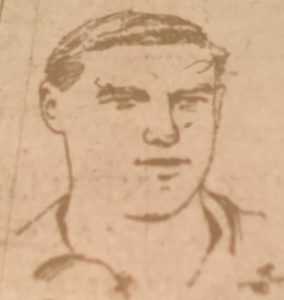 “I started in football about nine yeare ago in the ranks of the Lenzie F.C.” remarked the Partick forward in reply to the Record’s man’s invitation to tell the history of his football career. Our best player was Mt MacOuat, a back who has played an odd game tor Queen’s Park. and was much thought of in Hampden circles. My partner in the Lenzie team was Mr Wm. Ward who is now president of the Partick Thistle Club. We played together in a trial match in 1897-98 in Greenock promoted by the Scottish Junior F.A. I got my cap that season against Ireland, and we beat the Irish team at Belfast by 3 goats to 1. I had the second goal and all over our fellows did well. After that match I joined Partick and played six Second League games for them. The Thistle won the championship, and were elected to the First Divison. The two following seasons I remained there, and excepting on an odd occasion, when I played outside left I have always preferred the inside left position. In my first year at Meadowside I played for Glasgow against Sheffield at Cathkin Park. In that match I played alongside Davidson Berry of Queen’s Park, who was about the cleverest player I have partnered. “Yes. I left Partick Thistle after two years experience with the Thistle. Massey went to Bedminster and Bristol, and I joined Everton. Massey has come back again, and so have I. He is one of the trickiest forwards I know. Like most Scottish players I had to pass through the Everton Combination team before getting a place n the League eleven. At the end of three months I got a place in the first team. I played along with Settle the international forward, who was to have played against the Scottish League last Saturday. John Proudfoot was centre forward. Sharp, the Lancashire cricketer, and Jocky Taylor of Dumbarton were the right pair. Everton had a good team and I have a medal for the Liverpool Cup. We licked our local rivals Liverpool in the final by 2 goals to 0. “In my second season there I was chosen to play for Liverpool and District against Birmingham and District. Sailor Hunter, now of the Hearts. who should have been in the Anglo-Scot match, was inside right for Liverpool that day. McAulay, of Aston Villa, and now with Middlesbrough. and Bache, of the Villa, were in the Birmingham side. The game ended in a draw. It may interest and please the horny handed ‘black squad’ in Partick to learn that their favourite player, who stands 5 feet 9 inches, and weighs eleven stone, is a teetotaller and non smoker. As he is still to see his twenty-sixth birthday he is likely to assist his current club for some years to come. A further profile of Robert Gray can be found here.